The Solidarity Dojo was completed in 1970. It has been used as a place for studying the history and ideology of the nonviolent resistance in the land struggle. 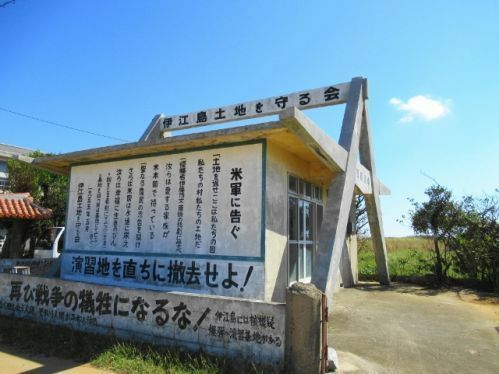 The names of individuals and organizations that supported the Iejima Land Protection Association’s activities are placed in the building. This includes a wide range of people, such as the first elected Okinawa governor Chobyo Yara and former chairman Baldwin of the International Human Rights Federation. As the building has aged, concrete has detached and fallen away. The repair work is expected for completion in March next year. Visitors are not allowed to enter the building during repairs. Donations start at 2,000 yen for individuals and 10,000 yen for organizations. These donations will be received at JP Bank “Wabiai no Sato Foundation” Symbol 17010, Number 20371481. For inquiries, call Wabiai no Sato at 0980 (49) 3047.